The Vietnam-Cuba Inter-Governmental Committee convened its 36th meeting in Havana on November 29 with the determination to continue strengthening and diversifying bilateral economic and trade ties. The event was co-chaired by Cuban Minister of Foreign Trade and Investment Rodrigo Malmierca Diaz and Vietnamese Construction Minister Pham Hong Ha. Speaking at the event, Minister Diaz said both sides are working hard to update their economic-trade cooperation roadmap for 2019. 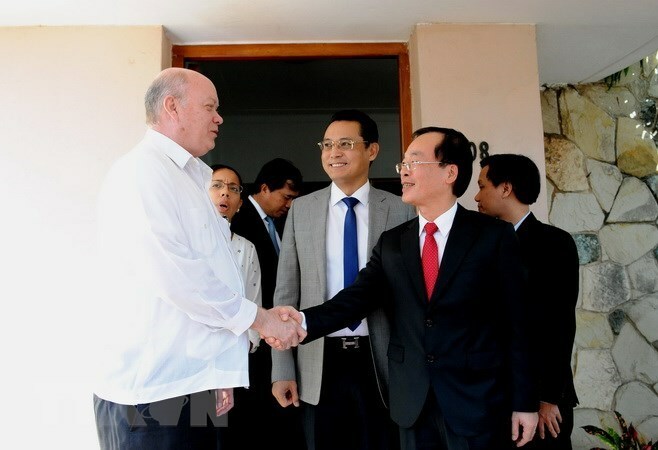 He added that with their special political relations as a foundation, reflected by General Secretary of the Communist Party of Vietnam Central Committee Nguyen Phu Trong’s visit to Cuba in March 2018 and President Miguel Diaz Canel Bermudez’s visit to Vietnam in October 2018, both sides are looking to lift two-way trade to 500 million USD in the coming years. Minister Ha highlighted healthcare and agricultural cooperation as promising fields that need to be tapped in order to tighten bilateral economic and trade links. He called for measures to create favourable conditions for investors who are keen to launch projects in Cuba, including Vietnam’s projects in the Mariel Special Development Zone. The same day, Ha held a working session with Cuban Vice President of the Council of Ministers Ricardo Cabrisas Ruiz. Both sides highlighted the progress made in bilateral ties in recent years, notably the new trade agreement signed during Cuban President Miguel Diaz Canel’s visit to Vietnam and various agriculture projects of note.